Some people simply must dress up in Star Wars costumes everywhere they go. For those people, PlayStation Home has become a much more comfortable place. If you've ever wanted to cosplay as a Star Wars character, but felt that it would just take too much effort in real life, now you have the much easier opportunity to do it in PlayStation Home. Sony and LucasArts have come together out of the goodness of their [money-grubbing] hearts to offer Star Wars clothing and furniture items for sale in the virtual world. 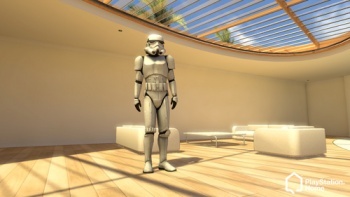 Brooks Brown, Community Manager for LucasArts, says that he always wanted to "run around as a Stormtrooper, telling people that they aren't the droids I'm looking for" in PlayStation Home. Folks, we've now witnessed the realization of this man's dream. Two outfits from Star Wars are being sold in PlayStation Home for $4.99 each: a set of Stormtrooper armor and an Imperial Officer outfit. That is, an Imperial Officer outfit if you have a male avatar. The Stormtrooper armor comes with an appropriate extra-chesty torso for female avatars, but apparently women cannot be Imperial Officers as the outfit isn't available to them. Could this be a scandal waiting to explode all over the faces of Sony and LucasArts? I think it should. Other Star Wars items up for sale are Yoda, Obi-Wan, and Jedi Order t-shirts (though women also do not get the Yoda shirt), Sith and Jedi banners, and a Star Wars: The Force Unleashed poster if you really love that game enough to pay a dollar to display your affection in a virtual house. The coolest item is the Blue Lightsaber, which is available to both sexes, but will run you a cool $4.99. A small price to pay for the weapon of the universe's greatest warriors, but where's the Sith red version? If Star Wars doesn't prick up your ears, LucasArts has also put an Indiana Jones hat and outfit up for sale. I imagine many YouTube videos are soon to come of treasure hunters and Stormtroopers dancing and, well, probably just dancing a lot. To purchase the goods, visit the PlayStation Home mall check out the store with the cool Yoda fountain in the display case, which we unfortunately cannot buy.